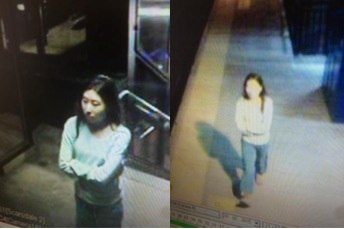 MISSING EDGEMONT TEEN BOARDED SOUTHBOUND TRAIN AT SCARSDALE STATION FRIDAY NIGHT | The Edgemont Community Council, Inc.
Greenburgh police tonight say that video surveillance confirms that missing Edgemont teen Christine (Ji Woo) Kang was last seen boarding a southbound Metro North train from the Scarsdale train station Friday night at around 10:18 p.m. UPDATE: Police now looking at video from Grand Central Terminal. Ms. Kang, a 16-year old junior at Edgemont High School, reportedly left her house on Robin Hill Road in Edgemont at around 8:30 p.m. Friday night after a brief argument with her parents. Police say she had left home before under similar circumstances, but would always return home within a short time thereafter. The police press release shows two photos of Ms. Kang on the railroad platform. The photos show her wearing a green pajama top and light colored pajama bottoms, with Uggs boots. Earlier today, Chief Chris McNerney said at a televised press conference that Ms. Kang was considered an “endangered” juvenile because she left home without a coat and temperatures are now well below freezing. Greenburgh police are seeking the public’s assistance in locating Ms. Kang and are urged to call police at (914) 989-1700. This entry was posted in Amber Alert and tagged #findchristine, Amber Alert, Christine Kang. Bookmark the permalink.